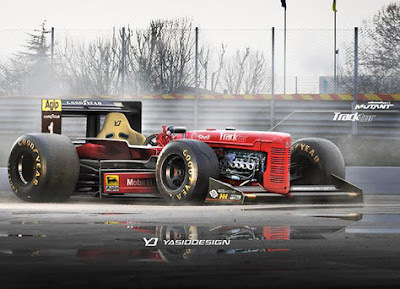 The idea of ​​creations in the automotive field can come from many aspects of life, it seems to have been done by an automotive designer site named Yasid Design who creates an unexpected digital manifestation of an old tractor into the Formula One (F1) racing car. Yes, it does look crazy - in the world's digital image engineering today almost all the wild ideas that can be realized in 3D images. Like Yasid who took an initial model of 1951 Farmall 'Super C' tracktor which is then transformed into the figure of F1 racing car. Let's us traced the origin of the creation of 3D images, initially a complete picture we can see that the project refers to the figure of 1930s Ford hotrod - very typical with the engine cross section left open without the cover. Then to its aerodynamics detail, which is a combination of the F1 car's exterior with Honda S2000 powertrain. Unfortunately, the car's interior appearance has not been visualized in detail, as it is shown here is the exterior only.